Bitcoin vs Ethereum: Is ETH a Better Choice than BTC in India? 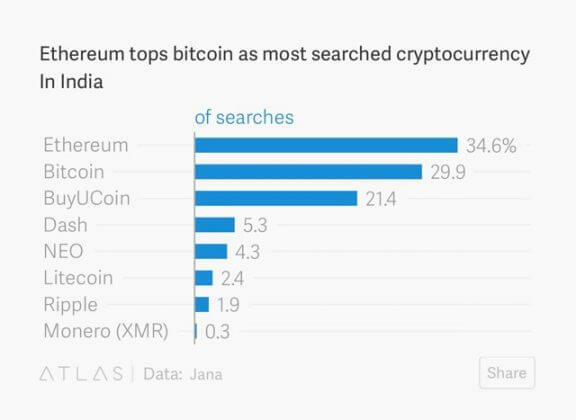 According to a report by a free internet provider Jana, Ethereum is the most searched cryptocurrency in India in the past 5 months. Ethereum holds 34.4 percent share of cryptocurrency searches as compared to Bitcoin that holds the share percentage of 29.9. The research done by Jana between October 2017 and February 2014 analyzed currency search terms and visits to cryptocurrency exchanges on mCent browser app. 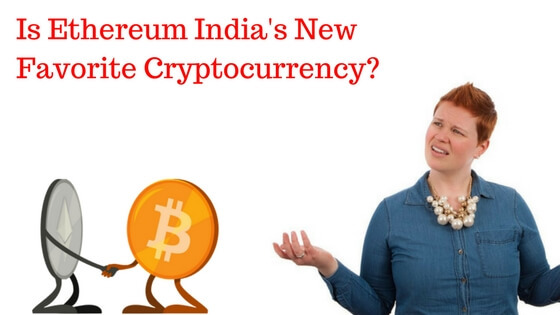 The result of the research does show the attention Ethereum – the second biggest cryptocurrency in the market in terms of market cap – has been enjoying among Indian investors. There’s no denying that more and more people in the country are purchasing ETH. This falls in line with the clichéd saying of “don’t put all your eggs in one basket”. With everyone more informed about the Cryptocurrencies and more exchanges emerging on the scene, investors are keen to diversify their portfolio and spread their risk. For this same reason, along with Ethereum, demand for Ripple has been surging as well. However, given the small user base of mCent browser app, one simply cannot simply say Ethereum has become a #1 choice for Indian crypto-community. The data from Google Trends of the past 90 days shows, with the large margin, Bitcoin still remains the most popular choice. What we are seeing is more awareness of the other digital currencies other than the mainstream BTC. People are diversifying their portfolio. As we know, Bitcoin isn’t having one of its best days. At press time, one BTC was trading at $7,043 on Bitstamp. On the other hand, ETH isn’t having great days either. It has been struggling just as much with its price seeing consistent dips. It is currently trading at $422. Recently, Reserve Bank of India has banned the purchase of Cryptocurrencies in the country. Read: RBI news on Bitcoin. SUBSCRIBE to Bitcoin India Wiki to stay updated on everything important happening in the crypto-world. P.S. If you haven’t already bought Ethereum, almost every top Indian exchange is offering this digital currency. Buy ETH on Zebpay, Koinex, and Unocoin.